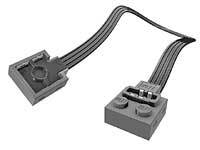 LEGO Power Functions system is the heart of building electronic system that allows us to bring life and functionality to our LEGO models, especially LEGO Technic ones. A battery box is responsible for providing power to the system. This battery may be conventional, requiring AA batteries, or may be a rechargeable battery. The battery box has a green indicator that tells us whether the system is operating. We can see an orange switch, which can be operated on both sides of its central position: in each of these sides it will activate the motor in a different direction of rotation. The battery box needs six 1.5V AA batteries. 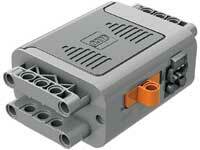 A battery box is capable of powering two XL motors or four medium-sized engines simultaneously. If we want to be a little more friendly to the environment we can make use of a different alternative energy: the rechargeable lithium polymer not only increases energy but is also lighter. This battery requires the 8887 10VDC transformer to recharge. The battery power is transmitted to the system through an electrical cable, which exists in various lengths: 20 and 50 cm. In order to get our models move we will use the Power Functions motors that connect to the battery plugs directly or through a cable extender. We can make the motor moves in either direction, depending on how the orange battery box switch is (in the middle position it does not transmit energy). 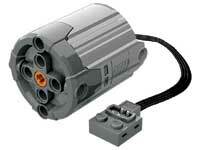 Both motors feature a small Power Functions cable and have an internal gearbox that increases the torque. 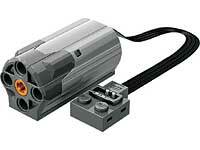 Power Functions motors are available in two sizes: medium and XL. The first has a length of 6 studs and a diameter of 3, while the largest has a diameter of 5 studs. The difference in performance is significant: while the M version has a no-load speed of just over 400rpm, the XL is about half. The maximum torque of the XL, with the stalled motor is 40 Nm, while the medium is around 12 N.m. While we can modify the rotation direction manually using the orange switch battery box, sometimes you may need a monitoring system which can be mechanically operated. This is the function of this switch, which controls the direction of rotation depending on the position of the orange arm. Power Functions lights can increase the realism of our buildings in the headlights, the lights of a lighthouse, and so on. Power Functions Motors Comparison, by Philo.